I had a wonderful time working on Lucy and Simons wedding flowers. 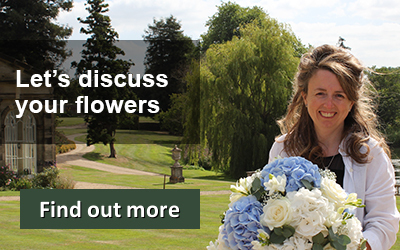 When I met Lucy to discuss her wedding flowers she had already decided on a colour theme of white, cerise pink and a hint of blue for her wedding at the Manor House Hotel in Moreton in the Marsh. The blue was chosen to pick up the colour of the bridesmaid dress you can see in the photo below. Cerise pink also stands out well in front of a dark colour like navy blue. I created a handtied posy bouquet of white calla lilies, blue thistle and cerise pink roses. I think you’ll agree it looks perfect in front of her stunning dress. Having seen a shower bouquet design that Lucy liked in our portfolio, I adapted it to suit her and we decided on using the small white calla lilies, freesias and cerise pink roses in her bouquet. When it came to choosing the wedding centrepieces, Lucy was inspired by a tall table arrangement she saw in our collection that featured the large ostrich feathers. It was therefore a natural choice to use the cerise pink ones to add colour and make a real statement in her wedding breakfast room at the Manor House Hotel. I placed white and cerise pink lilies, freesias, blue thistle and roses into these tall centrepieces with white daisies placed underwater in the vases. These were placed on half of the tables. The other half of the tables featured our beautiful low mirror cube vases with a bouquet of flowers and foliage to coordinate with the tall centrepieces. We have done lots of weddings where the couple have opted for both tall and low centrepieces. It works really well if you use the same flowers or colour theme. It’s also important to have at least eight tables as less would look a bit of a mismatch. 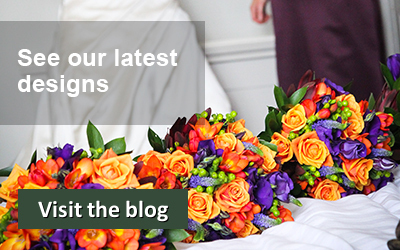 Phone us to arrange a consultation to discuss your wedding flower ideas and get inspiration from our portfolio of designs. I really will do my best to design your perfect wedding flowers.